In what has to be one very expensive fuel run, a C-17 Globemaster III flew 9,000 gallons of jet fuel from Al Udeid Air Base to a forward operating base near the front lines of Operation Inherent Resolve, refueling in flight on the way back home. I wonder how much each gallon actually costs? Especially after you figure in the costs of transporting it to the forward operating base and the in-flight refueling where each gallon runs around $25-35, depending on who you ask. This is a stark reminder of how expensive wars are. 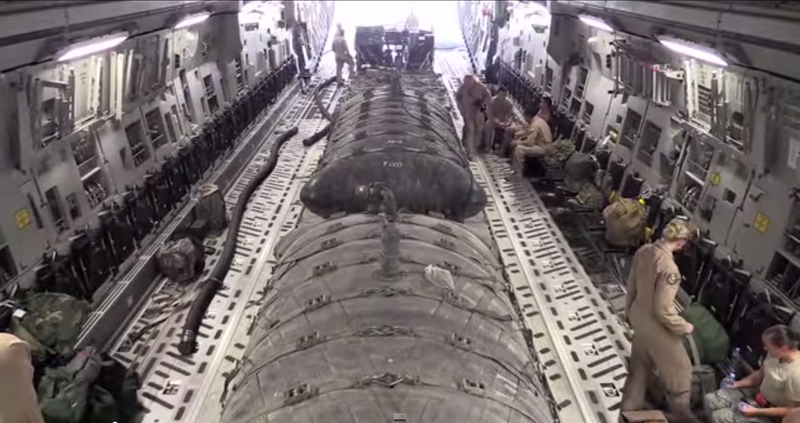 Moving 9,000 gallons of jet fuel, which seems like a lot, but really it isn’t, especially considering a C-17 carries 35,000 gallons in its standard fuel tanks alone. Even if the C-17 gave up a large portion of its internal fuel as well as the auxiliary fuel contained in the bladders, say 20,000 gallons total, that is equivalent 136,000lbs of fuel. This is approximately 12 fill-ups for an A-10 or 53 fill-ups for an Apache attack helicopter, both of which are miserly compared to their fast-jet fighter teammates. The cost of fighting an enemy with very low-end capabilities with high-end conventional military might is bewilderingly expensive, and just supporting these operations over a long period of time could send nearly any nation in the world into the red. We learned this in Iraq where we were paying Haliburton $45 for a six pack of Coke made locally in the Middle East. Moral of the story: war is very expensive, especially if you fight one foolishly without clear goals, overwhelming force, measurable results and an exit strategy.